Be the first to share your favorite memory, photo or story of Jettie. This memorial page is dedicated for family, friends and future generations to celebrate the life of their loved one. 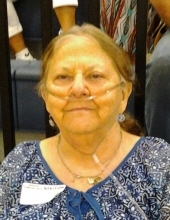 JETTIE MERLINE DAUGHERTY, age 80, of the Poplar Creek section of Grundy, Va., passed away Monday, April 8th 2019. She was born on March 23, 1939 in Poplar Creek, Grundy, Va. The daughter of the late Clarence ( Bon ) and Ethel Clevinger. Jettie was a loving wife, mother, grandmother, great-grandmother. She enjoyed talking to family and friends on the phone, All will miss those calls. She was an active member of the Bull Creek Old Regular Baptist Church at Harman. Other than her parents, Jettie was preceded in death by 2-Sisters: Joy Senters and Marie Bailey. Jettie was married to Ralph James Daugherty for 51 years On September 1, 1956, who also preceded her. She is survived by 1-Daughter: Rhonda Gail Stewart and Husband Randy. 2-Sons: Greg Daugherty and Wife Sherry, Wiley Daugherty and his wife Chrissy. She leaves behind 7-Grandchildren who loved and will miss her: Samantha, Josh, Jessie, Travis, Sarah, Brianna, Barbra, and 4-Great-Grandchildren: Gabriella, Mackenzie, Carmella, and Rylie, Brothers and Sisters: Jesse Clevinger of Freemont, OH, Vernal Ray Clevinger of Thonotosassa, FL, Jerry Clevinger of Big Fox, VA, Adrian Clevinger of Grundy, VA, Darrell Clevinger of Narrows, VA, Wanda Holman of Grundy, VA, Lois Matney of Hurley, VA, Carolyn Clevinger of Grundy, VA.
Visitation will be Friday and Saturday at 6:00 P.M. at the Grundy Funeral Home. Church services will be Sunday at 11:00 AM at the Bull Creek Old Regular Baptist Church at Harman Va. Burial will follow in the Mountain Valley Memorial Park, Big Rock, VA.
Pallbearers: Sons Greg Daugherty, Wiley Daugherty, Son-in-law Randy Stewart, Grandsons Josh Stewart, and Travis Daugherty, and Ronald (Gump) Blankenship. Mom, We had you for minute it seems, and we pray you visit us in our dreams, We pray you are now at peace and with God, who you loved so much. You’re arrival is no longer awaited for in heaven now, You are free of the pain and suffering of this Earth. We will miss your sweet smile and soft touch, and the peace you tried to bring to all of us. Your love will be forever in our hearts. Grundy Funeral Home of Grundy, VA is honored to serve the family of JETTIE MERLINE DAUGHERTY. To plant a tree in memory of Jettie Merline Daugherty, please visit our Tribute Store. "Email Address" would like to share the life celebration of Jettie Merline Daugherty. Click on the "link" to go to share a favorite memory or leave a condolence message for the family.